Have you ever noticed that cats have the magic ability to relax you? MC and I are always discussing the “sleep sauce” that our cats seem to produce when they lay at our feet. This little lovey provides a touch of comfort and a bit of warmth in a portable package. Just fold your lovey up and it fits into a bag for cuddling on the go. Each Ronald McDonald House is independently operated, and not all accept handmade donations. Please contact your local Chapter to determine if donations are accepted. Because Ronald McDonald Houses are places for families experiencing a stressful situation, I thought a lovey would be the perfect project. A lovey can provide comfort to a sibling and is portable enough to travel from the House to the hospital with ease. Before designing this pattern, I reached out to several moms and grandmothers for advice. All agreed that while a baby blanket or child’s sized blanket is great to have, those sizes are too large for a lovey that will be used on the go. For that reason, I opted for a small size for this project. This small lovey is easy to fold up and drop into a carry along, day bag. I used Loops & Threads Impeccable, an easy care yarn that can easily be laundered using washing and drying machines after a long day spent sitting in a waiting area or visiting a sibling at the hospital. Also, I made a flat, unstuffed head for the cat. These options make this project more portable and allow a child to lay down on the lovey, using the cat head like a flat pillow. If you make your own Sleeping Kitty Lovey, I’d love to see it! Share your progress and questions by tagging me on Facebook as @Underground Crafter, Instragram as @ucrafter, or Twitter as @ucrafter. Sign up for my weekly newsletter and get a coupon code for your choice of one of my premium patterns and other subscriber goodies. Plus, you’ll never miss one of my free patterns again! Add Sleeping Kitty Lovey to your Ravelry favorites or queue. This pattern is part of the Crochet Charity Drive’s Toy Drive. Join the Facebook group to get links to other great patterns that are perfect for charity. This sleeping kitty provides comfort and nap time companionship. This project was inspired by Ronald McDonald House Charities, an organization that provides a caring community for families with children being treated in hospitals. This pattern is one of many great projects shared by designers as part of the Crochet Charity Drive on Facebook. Lovey: 17” (43 cm) wide x 18.5” (47 cm) long blanket; 17” (43 cm) wide x 26” (66 cm) long with cat head attached. Loops & Threads Impeccable yarn (100% acrylic, 4.5 oz/128 g/268 yd/245 m) – 1 skein ea in 01222 Fern (CA), 01221 Soft Fern (CB), 01425 Soft Rose (CC), and 01044 True Grey (CD), or approximately 155 yd (142 m) ea in CA and CB, and 75 yd (68.5 m) ea in CC and CD in any medium weight yarn. Small amount of medium weight yarn in black, approximately 5 yd (4.5 m). US Size I-9/5.5 mm crochet hook, or size needed to obtain gauge. 12 sts x 8 rows = 4” (10 cm) in blanket pattern. Exact gauge is not critical for this project. cl – cluster – (Yo, insert hook in same st, yo and draw up a loop, yo and draw through 2 loops) 3 times, yo and draw through all 4 loops on hook. *Repeat instructions after asterisk as indicated. With CA, ch 58 (or any multiple of 2 sts, + 4). Row 2: Turn, ch 3 (counts as dc, here and throughout), cl in next, *ch 1, sk 1 st, cl in next st; rep from * across to last st, dc in last st.
Row 3: Ch 1, sc in first 2 sts, *sc in ch-1 sp, sc in next st; rep from * across to last st, sc in last st, changing to CB with last yarn over of final sc. Row 5: Rep Row 3, changing to CC with last yarn over of final sc. Row 7: Rep Row 3, changing to CB with last yarn over of final sc. Row 9: Rep Row 3, changing to CA with last yarn over of final sc. Row 11: Rep Row 3, do not change color. Rows 12-41: Rep Rows 2-11, 3 times. Fasten off. Continue on to Cat Face. Fasten off first Cat Face. Do not fasten off second Cat Face. Set aside second Cat Face with yarn attached for seaming. Continue on to Nose. Rep Row 3 until Nose reaches desired size. Fasten off with long yarn tail (approximately 8”/ 20.5 cm) for seaming. Continue on to Face Embellishment. Embellish first (fastened off) Cat Face piece. Thread yarn needle with yarn tail from Nose. Sew Nose to center of front side of Cat Face. With yarn needle, weave in ends on wrong (back) side of Cat Face. Hold both Cat Face pieces together with wrong (back) sides facing each other. With your crochet hook and holding the unembellished Cat Face piece towards you, choose the top center st on the embellished Cat Face piece. Starting at top center st, join pieces together with sc seam. (You can find my tutorial for the single crochet join here.) At end of Round, join with sl st to first sc to join. Do not fasten off. Continue on to First Ear. Fasten off. Continue on to Second Ear. With unembellished side of Cat Face facing you, join CD with sl st to fourth st to left of top center st (if right-handed) or to right of center st (if left-handed). Rep Rows 2-7 as for First Ear. Fasten off. Continue on to Neck. With embellished side of Cat Face facing you, join CD with sl st to fourth st to right of bottom center st (if right-handed) or to left of center st (if left-handed). © 2017 by Marie Segares (Underground Crafter). This pattern is for personal use only. You may use the pattern to make unlimited items for yourself, for charity, or to give as gifts. You may sell items you personally make by hand from this pattern. Do not violate Marie’s copyright by distributing this pattern or the photos in any form, including but not limited to scanning, photocopying, emailing, or posting on a website or internet discussion group. If you want to share the pattern, point your friends to this link: http://undergroundcrafter.com/blog/2017/03/10/free-pattern-sleeping-kitty-lovey/. Thanks for supporting indie designers! Back in January, I went to Phoenix for Creativation, the trade show of the Association for Creative Industries. One of the best parts of this event was getting the opportunity to meet representatives (in person!) from some of the craft brands I work with all the time. This post contains affiliate links. Materials for the sample were generously provided by Clover USA and Fairfield. When I met the folks from Fairfield, I mentioned that I was planning to feature My Recovery Buddy in an upcoming charity spotlight post, and they explained that Fairfield already works with this charity to provide Poly-Fil stuffing. They were kind enough to provide me with a 3 ounce bag of Poly-Fil, which was just the right amount for stuffing this little dude. Similarly, once I saw the new Quick Locking Stitch Marker Set at the Clover booth, I knew these ultra-thin stitch markers would be perfect for using with amigurumi and other stuffed creations because the markers wouldn’t stretch out stitches. (If you’d like to see some of the other ways I use stitch markers, check out 5 Reasons to Use Locking Stitch Markers.) It was great to put both of these freebies to use for such a good cause. This month’s charity spotlight pattern for My Buddy Friend includes detailed assembly instructions, so if it’s your first crochet softie, don’t worry! My Recovery Buddy accepts crocheted, knit, or sewn buddies. 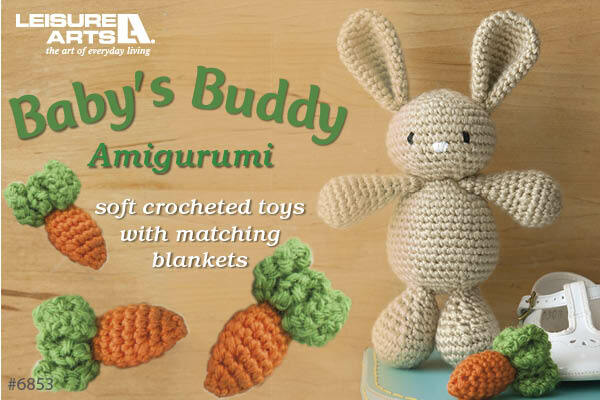 You can find the guidelines for creating a buddy here, as well as free crochet and knitting patterns for buddies. Individuals can request buddies here. Because buddies may include small pieces, they are not recommended for children under the age of five. Requests for buddies for children under 18 must be completed by a parent or guardian. If you’d like to chat with other crafters while working on your buddy, be sure to check out the My Recovery Buddy Ravelry group (sign in required). You can also get updated information on current requests in the group so your buddy can be customized for someone in need. If you want to save money on postage, you can mail unstuffed buddies to My Recovery Buddy for stuffing and finishing. If you don’t have time to crochet something of your own, you can also donate postage or gift cards to craft supply stores. More information is available here. While My Recovery Buddy gives its volunteer makers a lot of creative freedom, they do ask that buddies measure about 6.5″ (16.5 cm) to 7″ (18 cm) square once completed. Buddies should be free of sharp pieces, such as buttons, because that makes them less huggable. While any yarn can be used, a machine washable/easy care yarn is recommended. This allows your buddy to be distributed to people in a variety of settings. I used Red Heart Super Saver, an acrylic yarn that holds up well to frequent washing. Buddies should also include two arms of equal length (at least 2″/5 cm long) and two legs of equal length (at least 3″/7.5 cm long). Finally, buddies should have a cheerful expression! To make sure your buddies last a long time and are safe, yarn tails should be very securely woven in. If you’d like to learn about other charities that accept handmade donations (and get more free crochet patterns), check out my monthly charity spotlight posts! If you make your own My Buddy Friend, I’d love to see it! Share your progress and questions by tagging me on Facebook as @Underground Crafter, Instragram as @ucrafter, or Twitter as @ucrafter. Sign up for my weekly newsletter and get a coupon code for your choice of one of my premium patterns and other subscriber goodies. Plus, you’ll never miss one of my free patterns again! Add My Buddy Friend to your Ravelry favorites or queue. This simple stuffed toy makes a portable pal for a child. It meets the donation requirements for My Recovery Buddy, a charity that distributes handmade, huggable buddies. This pattern is one of many great projects shared by designers as part of the Crochet Charity Drive on Facebook. Approximately 7” (18 cm) square when seated with arms together; approximately 11.5” (29 cm) tall from hair to toes x 12” (30.5 cm) across from arm to arm when standing. Red Heart Super Saver (100% acrylic, 7 oz/198 g/364 yd/333 m) – 1 skein ea in 505 Aruba Sea (CA), 360 Café Latte (CB), 316 Soft White (CC), and 365 Coffee (CD), or approximately 145 yd (132.5 m) in CA, 38 yd (35 m) in CB, 15 yd (14 m) in CC, and 20 yd (18 m) in CD in any medium weight yarn. US Size H/5 mm crochet hook, or size needed to obtain gauge. 3 oz (85 g) of Fairfield Poly-Fil. Exact gauge is not critical for this project but stitches should be small so that fiber filling doesn’t show. When choosing colors, note that CA is used for the body, hands, and feet. CB is used for sleeves and pant legs. CC is used for smile and whites of eyes. CD is used for hair. Locking stitch markers are used to track the corners of body and the last stitch of Rounds in arms, legs, and eyes. Once placed, the markers should be moved up every Round. Do not remove markers after fastening off body because markers aid in positioning pieces for assembly. Rnd 1: Ch 1, 8 sc in ring, pull yarn tightly to close ring, join with sl st to first sc. Rnd 3: Ch 1, starting in same st, [sc in ea st across to marked st, 3 sc in marked st, move marker to second sc] 4 times, sc in ea st across to last st, join with sl st to first sc. Rep Rnd 3 until body measures approximately 6.5” (16.5 cm) square. Fasten off. Rnd 1: Sc in ea st around, do not join. Rep Rnd 1 until sleeve measures approximately 2” (5 cm) long, change to CA. Rnd 2: Rep Rnd 1. Rnds 4-5: Rep Rnd 1 twice. Rep Rnd 1 until pant leg measures approximately 3” (7.5 cm) long, change to CA. Rnd 4: Rep Rnd 1. Designate one body piece as the front side of body. Use stitch markers to position eyes and mouth on front side of body. Thread long yarn tails with yarn needle. Sew eyes and mouth into position. Weave in yarn tails on back of body piece. With yarn needle, weave in yarn tails at foot and hands. Stuff arms and legs with Poly-Fil. Use yarn tail at base of arms and legs to sew sleeves and pant legs closed. Thread yarn needle with long strand of yarn (approximately 12”/30.5 cm long). Center one arm between eyes and nose at second Rnd from edge of body. With yarn needle and yarn, sew arm to of front of body. Repeat for other arm on opposite side of front of body. With yarn needle, weave in yarn tails on back of the front side of body. Position front of body over back of body with wrong sides facing together. With back of body facing you, join CC with sl st to side body above top of sleeves. Working through the inner loop of both layers of the body, join lower half of body (from arm down to corner, across the bottom below the mouth, and then up the side to the top of the arm) with sl st seam across to top of other arm, being sure to line up stitches and match marked corners. (A tutorial on joining with a slip stitch seam is available here.) Fasten off CC. Thread yarn needle with long strand of yarn (approximately 12”/30.5 cm long). Center legs below mouth at second Rnd from edge of body. With yarn needle and yarn, sew leg to of front of body, being careful to work through front layer of body only. Rep to attach other leg. With yarn needle, weave in yarn tails inside of body. With front of body facing, join CD with sl st at next st above arm on side. Ch 1, working through both layers of the body, join the side and top of body with sc seam. (A tutorial on joining with a single crochet seam is available here.) Do not join body completely. Leave side open to stuff. Stuff body with Poly-Fil. Continue sc seam around to other arm. Do not fasten off. Turn, ch 1, sc in same st, *ch 4, sc in next st; rep from * across to last st in CD. Fasten off. With yarn needle, weave in any remaining ends into inside of body. © 2017 by Marie Segares (Underground Crafter). This pattern is for personal use only. You may use the pattern to make unlimited items for yourself, for charity, or to give as gifts. You may sell items you personally make by hand from this pattern. Do not violate Marie’s copyright by distributing this pattern or the photos in any form, including but not limited to scanning, photocopying, emailing, or posting on a website or internet discussion group. If you want to share the pattern, point your friends to this link: http://undergroundcrafter.com/blog/2017/02/17/free-pattern-my-buddy-friend/. Thanks for supporting indie designers!